The purpose of the KonaKart Messenger Bot is to help customers find products managed by a KonaKart store, using the Messenger interface. The bot goes beyond simple keyword searches and uses the wit.ai artificial intelligence engine to attempt to understand certain message types (intents) and to respond accordingly. More technically, it’s a servlet that receives messages from Messenger and uses wit.ai artificial intelligence to attempt to understand them. Wit.ai allows you to build a Siri-like speech or message interface by turning natural language (speech or messages) into actionable data. 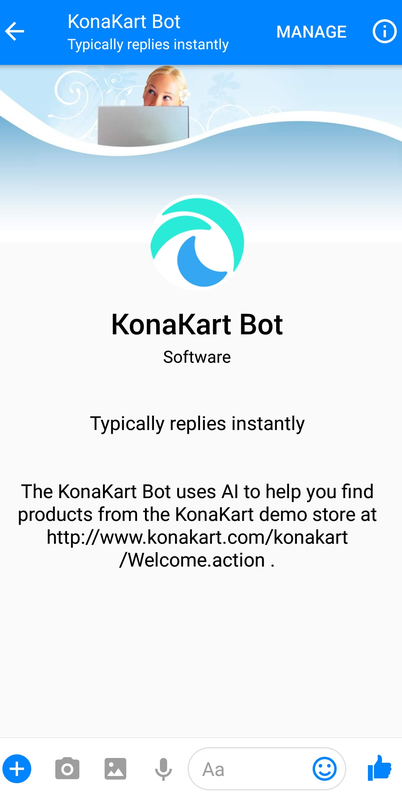 Based on the interpretation by the artificial intelligence engine, the bot servlet communicates with a KonaKart engine to find products and sends the result back to the Messenger user as a reply message. The full source code is available, and it’s architected in order to allow you to add functionality in order to process more message types. It can be considered as a framework allowing you to create your own bot with bespoke functionality. KonaKart also provides a consultancy service to customise the Messenger Bot to match your business requirements. You can create intents (user defined entities) and train your Wit app to recognize these intents so that the bot can act on them.